ACCIONA’s FISSAC project: Fostering Industrial Symbiosis for a Sustainable Resource Intensive Industry Across the Extended Construction Value Chain. Brief scheme of FISSAC Project concept. The FISSAC project involves stakeholders at all levels of the construction and demolition value chain to develop a methodology, and software platform to facilitate information exchange. These can support industrial symbiosis networks and replicate pilot schemes at local and regional levels. 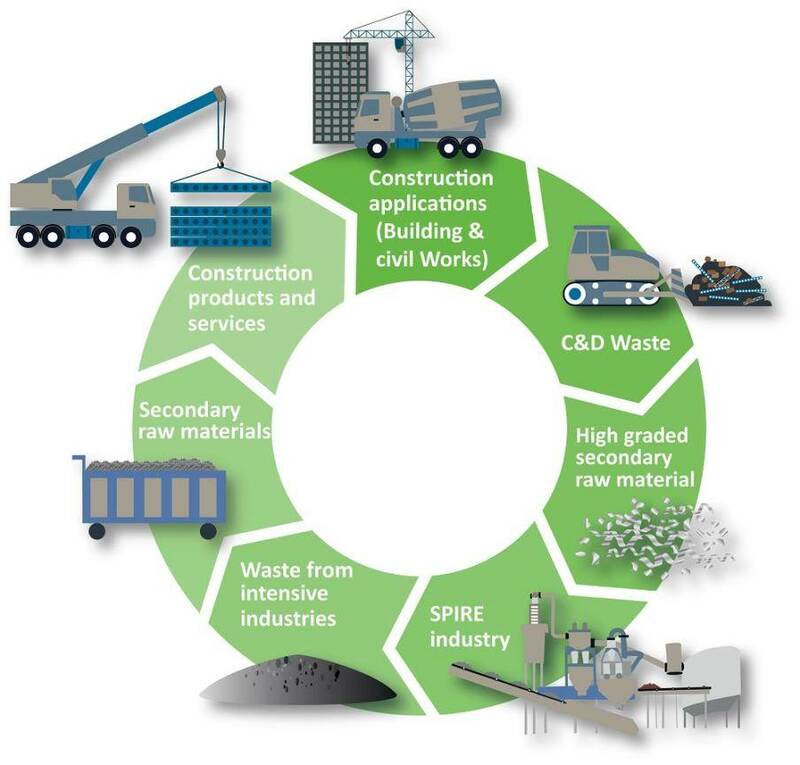 FISSAC aims to develop and demonstrate a new paradigm built on an innovative industrial symbiosis model towards a zero waste approach in the resource-intensive industries for the construction value chain, tackling harmonised technological and non-technological requirements, leading to material closed-looped processes and moving to a circular economy. Demonstration of closed-loop recycling processes to transform waste into valuable acceptable secondary raw materials. Demonstration of the manufacturing processes of the novel products at industrial scale. Demonstration of the eco-design of eco-innovative construction products (new eco-cement and green concrete, innovative ceramic tiles and rubber-wood plastic composites) in pre-industrial processes, under a life-cycle approach. Demonstration at real scale of the application and technical performance of eco-innovative construction products in a variety of case studies. Demonstration of the software platform. Replicability assessment of the model through living lab concept (as a user-centred, open-innovation ecosystem, often operating in a territorial context). 15% reduction of waste generation [170,298 kt/y]. 12% gains in productivity for waste treatment [30.36 Mt/y]. Volume of resources & products from waste: Total savings for the EU- concrete sector up to 25 M€. 1,200 M€ – 1,350 M€ associated with consumption of Portland cement. 15% reduction of waste generation. 12% gains in productivity for waste treatment. 20% in energy efficiency and GHG savings. Development of Industrial Symbiosis indicators to quantify FISSAC model impact, in line with Key Performance Indicators of SPIRE PPP. Development of new eco-cement, new green concrete, innovative ceramic tiles and rubber wood plastic composite as a result of the eco-design of eco-innovative construction products developed under FISSAC model. Employment: new job opportunities, training needs on circular economy. Social behaviour & citizen engagement (Social Advisory Board, Living Labs to gather views, share knowledge develop prototypes, encourage sustainable behaviour). Regulatory: When working with innovative construction products, there is a lack of standardisation and national regulations to apply it on sites, so it is necessary to work closely with standardisation bodies since the beginning of the project and plan carefully the demonstration activities. Financial: In the FISSAC project, new circular economy business models are being analysed as part of the works of WP8.